Enjoy a day combining Meditating & Creating. We start with a 45 minute Chakra meditation - a powerful meditation using the breath to move through and energize each chakra. 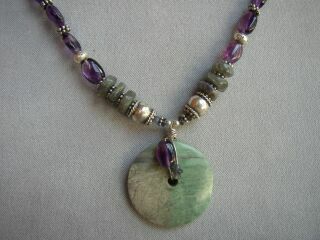 The next few hours relax into your creative juices and create for yourself an empowerment necklace or bracelet. 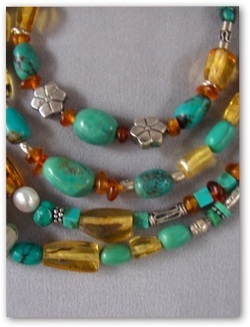 Ancient cultures have long used jewelry and embellishments to symbolize and celebrate life passages. Make a piece to celebrate your personal transformation here at the lake, or just make a piece of jewelry that is uniquely you. Some guidance given on healing & esoteric qualities of stones. We end the day with an empowerment visualization. Choose from over 30 types of beads - Semi-precious stones, pearls, turquiose, metal, bone, shell including beads and seeds indigenous to Guatemala. Pendants and specialty stones are available for purchase to enhance your piece. Deva Prema is an experienced jewelry designer and producer. Long time meditator with an eclectic practice including dynamic & breath meditations. Minimum 4 people ; Maximum 6. Beautiful, Useful and Enduring.....a Chinese saying about the qualities of the objects that we surround ourselves with must possess. I think of my 'one of a kind pieces' as having these qualities. They are created with stones & beads that I pick up on my travels and from artisan vendors that come to Lake Atitlan.